Last night, around 23:30, citizens of Split heard large detonation. Cause of such detonation was and still is matter of intense speculation and all kinds of weird theories. Police in its official communiqué says that its patrols didn’t find anything. If I have to guess, I would say the detonation was caused by a meteor. On the surface, presidential bid looked like a win-win proposition for Jadranka Kosor. If she won, she would become President. If she lost, she would merely return to her ministerial post, even being praised by her opponent Stipe Mesić (Stope Mesic) and perceived as Sanader’s heir apparent. Unfortunately, presidential elections, like any elections, feature this nasty category called “election promises”. Kosor, who was in charge of war veterans and their affairs, made more than her share of them. And after she lost, it turned out that many war veterans took those promises too seriously. Now Kosor – who was supposed to be the most popular and most “humane” member of Sanader’s inner circle - has to deal with constant death threats and occasional public spectacle of Jan Palach-style self-immolation of the very people whose interests she claimed to champion. Kosor’s public standing is so low that the idea of fielding her as HDZ candidate for Zagreb mayor quickly died. Kosor apparently can’t take it any more – she offered Sanader her resignation to the post of minister of family, veterans and inter-generational solidarity, while retaining post of deputy prime minister. But she is most likely to stay for a while. It seems that Kosor managed to wreck her ministry so thoroughly that nobody wants her job - just like nobody wants to take the hot seat of semi-retired interiors minister Marijan Mlinarić (Marijan Mlinaric). It seems that Serbia-Montenegro has just increased its chances to join EU. It is nevertheless going to be a very slow process with plenty of unexpected complications. But I doubt that Croatian media are going to pay much attention to this story. On the surface, this shows that Croatian chances of joining EU are very good –it is assumed that Croatia always had, still has and always will have great advantage over Serbia-Montenegro in all matters European. On the other hand, this story shows that EU Croatia is going to join will, in a foreseeable future, also include Serbia. And that kind of EU is not EU many Croatians would like to live in. Although I haven’t finally decided to move this blog, I’ve already begun work on moving archives. It is much harder and more time-consuming that I ever imagined. Blogging is going to be light, as you might imagine. I guess I’m not the only one who had these problems. So, you probably won’t be very surprised when I tell you that I’m seriously considering transferring this blog to another host. So far, the only argument against that decision is the sheer size of the blog. So many posts have gathered in last two years and copying all those posts and archives (and even when comments are discarded) is going to be Herculean effort. Needless to say, any suggestion is going to be more than welcome. And the conclave is going to have three options. They could return to old ways and elect safe, predictable and utterly faceless Italian bureaucrat. This option might leave some hope for those expecting a liberal pope, because new pontiff might “grow in office”. But it is unlikely that the conclave will settle for that, because it would be perceived as a step backward for Church. As expected, Sanader’s government has called local and regional elections for May 15th 2005. Although Croatia happens to be very centralised country and, therefore, local and regional governments, especially those in impoverished and war-ravaged areas like Slavonia, Lika and Dalmatia, don’t amount to much, the elections are going to be very important for two reasons. First, no government has ever called those elections in such bad shape as Sanader’s government did. Unfulfilled election promises, corruption and other scandals, razor-thin Sabor majority and two major fiascos – disastrous presidential bid by Jadranka Kosor and even more disastrous handling of Gotovina affair – made Sanader’s government look very weak. Although late polls show slight surge of support for HDZ, numbers are still very worrisome for Sanader – it is very likely that his party will at least a third of voters who had brought him to office in 2003. The elections will also be an indicator of a long-term future prospects for some of major players on Croatian political scenes. For example, almost everyone expects HSP, far right and mildly Eurosceptic party, to knock left-centre HNS from the third place. The elections are also going to provide answer to another important question – whether Croatian people are serious about their new-found Euroscepticism. Immediately after E-Day fiasco on March 17th, many media commentators became very anxious about local and regional elections, because the campaign, despite of their nominally local nature, is going to be a fertile ground for populist and, therefore, Eurosceptic rhetoric. Some even called for Račan (Racan) and Sanader to prevent that by formalising their tacit alliance and forming joint ticket for the elections. This scheme might look attractive on paper, but Sanader is all too aware that it won’t sit well within his party rank-and-file. Branimir Glavaš (Branimir Glavas), Slavonian HDZ boss and one of Sanader’s top party allies, has already strayed from the official “EU At Any Cost” line by blaming EU, and not Gotovina, for March 17th fiasco. Electorate, especially on local levels - where HDZ traditionally fared worse than on national level – is going to be even less forgiving. Sanader can expect to have some success at elections – or, to be precise, avoid disaster – only by tolerating at least some Euroscepticism and hard-line nationalism in his party. Some commentators attribute the modest HDZ surge in polls to that. It seems that Sanader took those commentators seriously, at least in case of Zagreb City Council elections. Control over Croatian capital – where the GDP is four times national average – is the most precious and most coveted electoral prize. Unfortunately for Sanader, Zagreb also happens to be the lost cause for HDZ – it would take at least a generation or two for Zagrebians to forgive renaming of Dinamo Zagreb, attempted shutdown of Radio 101, “opposition situation in capital” and other 1990s sins of Tudjman’s party. Furthermore, at this point Zagreb City Council elections look very much like presidential contest looked before January 2005 – more of a coronation than competition. Just as Stipe Mesić (Stipe Mesic) was expected to cruise comfortably into second term, Milan Bandić (Milan Bandic), SDP überboss and deputy mayor, is widely expected to return to mayoral office which he had to leave following drunk driving incident three years ago. His ticket, based on the solid support of blue-collar Zagreb suburbs and huge network of backers in Zagreb business community, has attracted many of his former enemies – namely conservative HSS, humiliated by him in 2001 elections – and is now expected to get more than 40 %, which could all but guarantee comfortable majority in City Council. Croatian media – partly in order to push pro-EU line, partly in order to have some excitement in the race – created some sort of archrival for Bandić in the form of HNS leader Vesna Pusić (Vesna Pusic), whose party is nominal coalition partner of SDP in current city government. Pusić, a typical Limousine Liberal intellectual, tried very hard to match Bandić’s populist skills, but most people see double digit numbers as the only thing HNS could expect to call success after these elections. More interesting challenge to Bandić comes from the Right. And this is where Sanader tried to do something by floating the name of Andrija Hebrang, former health minister and unofficial leader of Tudjmanist hard-right within HDZ, as his party’s mayoral candidate. Hebrang, who was forced to leave his post due to deteriorating health, publicly declined the offer. And with good reason, since HDZ can expect nothing but defeat in Zagreb and whoever leads the ticket is going to be as marginalised as Kosor is after her disastrous presidential bid. This leaves Sanader with few options. Of course, HDZ will have its ticket, just for the sake of prestige, and by attracting some minor players like HSLS or DC, it could expect to jump above 20 %, but nothing can prevent opposition to keep Zagreb as its stronghold for next four years. Even if HDZ keeps the seats it currently has, it could be interpreted as nothing less than another of Sanader’s failures. And, there is always very real prospect of HDZ losing its Zagreb constituency to other players from the Right – HSP and Boris Mikšić (Boris Miksic). The latter, a native of Zagreb, showed great potential to be a spoiler, despite his apparent lack of political experience, as a spoiler. After presidential elections media was in full attack mode, portraying him as sore and pathetic loser, as well as wife beater. But it didn’t have much of an impact, at least judging by the recent polls. In Zagreb his ticket can expect 10 %, which is more than enough for seats in City Council. And, needless to say, those seats will be at the expense of Sanader’s HDZ. On the other hand, if he is as shrewd politician as media often portray him to be, Sanader can transform calamity into opportunity. HDZ will get beaten badly in Zagreb and Mikšić can emerge as another right-wing icon in Croatia, but his ascendancy might be a good argument for Sanader to get at least some bones from EU diplomats in Brussels. Sanader can argue that EU has a choice between dealing with proper pro-European like him now or with dangerous Eurosceptic populist like Mikšić in near future. Tim Gueguen added to blogroll. Few links to various Croatian media added. At last week’s Croatian box-office, that is. We live in really interesting times when Croatian daily newspapers reports about new polls showing 51 % of Croatians supporting Croatian entry to EU as a wonderful news. However, even if such triumphalism clearly shows pro-EU bias of Croatian media establishment, it also shows how desperate things look to average Europhile. Any, even the slightest, reversal of anti-EU trends is hailed as major victory. The last polls, conducted a month ago, showed support for EU to be 47 %, which means that the number of pro-EU Croatians rose by 4 %. And 4 % is what American political pundits like to call “margin of error” whenever they discuss polls. Some other EU-related polls, however, aren’t likely to catch attention of Croatian media. For example, polls showing the majority of Frenchmen against ratification of European constitution were never reported in Croatian newspapers, magazines or other media. It is very likely that Croatian media establishment doesn’t want Croatian people to get strange ideas, especially before local elections when any party or candidate outside pro-EU mainstream happens to be totally ignored. Last weekend Jutarnji list and Večernji list (Vecernji list) published results of two surveys about Croatian reading habits. Both newspapers claimed to be the most read among Croatians. I tend to believe the survey giving the top spot to Jutarnji list, and for a simple reason. It is more likely that Jutarnji list is going to have bigger circulation because it is both the “serious” daily newspaper and tabloid. Večernji list enjoys reputation of “serious” newspaper, while the tabloid status is reserved for 24 sata, which holds 3rd place in both surveys. However, it seems that Jutarnji list publishers are increasingly uncomfortable about other two daily newspapers (who happen to be published by same media conglomerate). So they upped the ante and used another secret weapon in their endless war to secure leadership. Only two years after offering snobbish literary classics with bargain prices to Croatian masses, they offered the most popular book of our times – J.R.R. Tolkien’s Lord of the Rings, which would be sold on newsstands for approximately 12 €. And just like the bargain DVD on newsstands had devastating effect on Croatian film and video distribution, it is very likely that those bargain books are going to badly hurt Croatian publishing industry. Some Croatians who believed in that had rude awakening in Skopje, Macedonia this afternoon. RK Zagreb, Croatian handball team, was playing European Cup Winners' Cup semi-final game against home side of Vardar. The game was aired by Croatian state television. Home side's fans, of course, couldn't resist the opportunity given by minute of silence and they booed at the mention of Pope's name. So, late Pope might have really strived for peace and multi-cultural coexistence, but he nevertheless left a lot of work to be done. Soviet Union isn't the only empire outlived by Pope John Paul II. This week Croatian media also reported about the death of an institution which was widely perceived as undestructible only few years ago. And that institution also had distinctively Split flavour. It all began half a decade ago when Sabor finally passed legislation legalising sports betting and allow private individuals to open bet shops. Until that time the only place in Croatia where you could make sports bets legally were small bet shops owned by Croatian state lottery and the only bet was known as "sports forecasting" – attempt to predict results of 13 soccer matches once a week. What happened was a textbook example of former state monopoly being outclassed by private enterpreneurs. Almost immediately, two huge chains of privately owned bet shops opened all over Croatia. First one was Prva Sportska Kladionica (PSK), where one of the owners was Marijan Primorac, Herzegovina tycoon, these days best known as father of "socially acceptable" teenage killer. 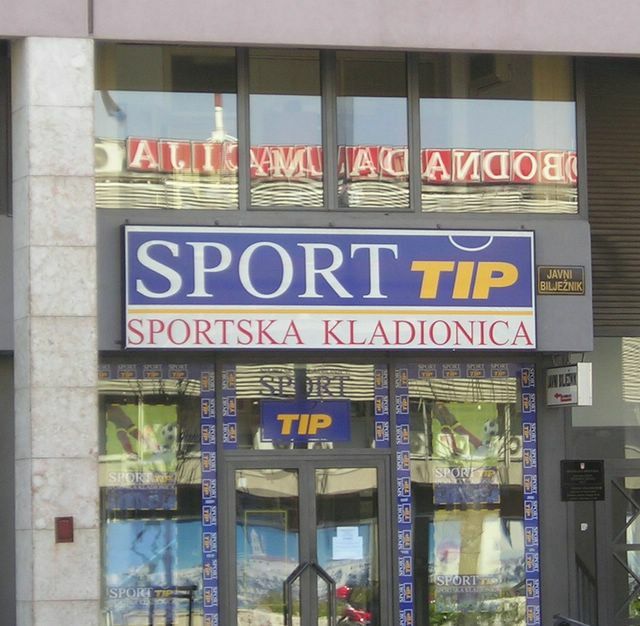 Another one, Sport Tip, was found few months later but it quickly compensated its lack of head start with their owners being some of the greatest sports celebrities in Croatia. The founders of Sport Tip in Croatia were three veteran players of Hajduk Split - Igor Štimac (Igor Stimac), Alen Bokšić (Alen Boksic) and Aljoša Asanović (Aljosa Asanovic) – joined by Goran Ivanišević (Goran Ivanisevic), tennis superstar that would enter history books by winning Wimbledon in July 2001. All four men were successful athletes, all came from Split, all apparently had plenty of money and all were close friends. Igor Štimac, who, at the time, had some political aspirations and didn't hide his sympathies for Croatian right-wing, quickly established himself as unofficial leader of a pack. That was mixed blessing for Sport Tip – on one hand, new firm benefited from his tough leadership, on the other hand, it was harmed by negative publicity coming from media reports about his violent temper. Even more questionable was Štimac's official position within Hajduk, which created interesting situation whenever his shops offered betting on Hajduk games. But it all had very little effect on masses of Croatians who embraced this new phenomenon with open heart. In first months bet shops were simply besieged by customers and on weekends, in hours before crucial soccer matches all over Europe, it wasn't uncommon to see hundreds people cueing on the streets in front of Sport Tip bet shops. Nobody can say for sure how much money Štimac and his friends made out of Sport Tip, but it was lot. Sport Tip was undoubtedly a successful commercial enterprise – something rare in early 21st Century Croatia, and even greater rarity in Split. However, like all Croatian success stories, this one came to a end. Very soon PSK and Sport Tip were joined by rival bet shop chains, some of them British and German franchises. Their number quickly multiplied and it all had very interesting effect on PSK and Sport Tip. First, after few months number of customers decreased. At first everyone believed that they can make money in bet shops, and they looked like very democratic institution, greeting homeless people and richest businessmen in same manner. This didn't last for long – the former quickly learned that they can't engage in betting as much as the latter. Those who remained now had more options to spend their money and, more often than not, Sport Tip had to fight to keep their regular customers with more attractive odds. After few years, Sport Tip also had to deal with many of their customers gaining more experience and having more successful bets. As a result, profits for Sport Tip began to slide. Croatian state also finally recognised sports betting as a source of income. Tax regulation was changed at bet shops' expense and Croatian state lottery finally introduced its own betting operation. All those developments, of course, were followed by internal divisions between former friends and colleagues. Finally, in last few months, both Primorac and Štimac threw towels. PSK is offered for sale to Croatian state lottery while Sport Tip filed for bankruptcy. It is estimated that 250 employees of Sport Tip are going to join the growing ranks of Croatian unemployed. They, however, aren't the only people who are going to react to this development with certain sadeness. Among all Sport Tip bet shops the most popular – at least judging by the way it was often portrayed in Croatian television – was the one situated in Split, in the buidling opposite the offices of Slobodna Dalmacija. Many reporters, editors, technicians and other members of Split daily newspaper's staff have spent a lot of time and money in that particular spot and their example was followed by other elements of Split media establishment. So, I wasn't surpised when I found an interesting image in one of the recent issues of Slobodna Dalmacija – the image that could be interpreted as some sort of emotional tribute to the fallen empire. While Croatian media is totally preoccupied with events in Vatican, ordinary life in Croatia still goes on. But yesterday something extraordinary happened in Sabor. Thankfully for Sanader, few people in Croatia are going to notice it. Croatia is about to have local and regional elections – most probably on May 15th. According to good Croatian custom, ruling party or coalitions are engaging in all kinds of tricks to woo voters – from making all kinds of promises, opening buidling sites to good old gerrymandering. The latter was one of Tudjman's favourite practices and his successor Ivo Sanader has to thank 1999 electoral law - which Račan (Racan) didn't bother to change during his reign – for his current position of prime minister. Because of the nature of local and regional elections, Sanader used indirect form of gerrymandering – instead of redrawing electoral districts within particular counties, cities and municipalities, he pushed for the legislation that would reorganise system of local and regional government in Croatia, or, in other words, redraw boundaries of counties, cities and municipalities in order to have HDZ-friendly populations concentrated in most strategic spots. In normal circumstances, this wouldn't be much of a problem. But the package – which included forming of eight new municipalities all over Croatia - included reorganisation of local administrative units within Vukovar-Srijem County. Sanader's cabinet accepted the ammendment, proposed by HDZ Sabor representative, which would change some municipalities' boundaries in favour of ethnic Croats. Problem was in ethnic Serbs in those municipalities being represented by SDSS, Serb nationalist party which just happens to be part of Sanader's government majority. When SDSS failed to make HDZ drop their amendment, their represenattives in Sabor voted against the bill. In good old times, HDZ could expect the bill to pass with help of MSes from "patriotic" opposition – people who would never side with Serbs out of principle, or at least use this as an argument for supporting government. Yesterday, all those people failed to provide that service to Sanader. Bill had only 76 votes "for" – one short of necessary majority. Not so long ago things like government bills having one vote less than necessary majority weren't problem, because Sabor speakers used all kinds of creative arythmetics and similar tricks. But yesterday Sabor speaker Vladimir Šeks (Vladimir Seks), much to the surprise and shock of his party colleagues, decided to let the vote results stands. So, for the first time in Croatian history, important government bill was defeated in Sabor. The precedent itself is going to cause more damage to the ruling party at the eve of local elections than any benefits that could be gained with proposed gerrymandering. Sanader's omnipotence, as well as omnipotence of his party, is fianlly revealed as an illusion. After yesterday, it became painfully obvious that government could actually lose its Sabor majority any day and voters in various local communities, who are supposed to be wooed by promise of financial aid from central government, shall think twice before supporting losing team. This must be pretty bad year for Sanader. After losing his closest associates and allies and suffering worst possible fiasco on E-Day, he is faced with this. Whatever could go wrong for Sanader is going wrong. Murphy's Law could be renamed into Sanader's Law. I just hope this was an April Fools joke.